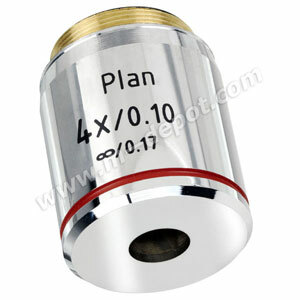 This is a brand new 4x Infinity Plan Achromatic microscope objective lens. It fits RMS standard compound / biological microscopes and works with many models including, but not limited to: Olympus, Zeiss, Accu-Scope, Motic, Unitron, etc. Note: Does not work with Nikon, Leica or other non-RMS standard microscopes.